The final moment of "I Got Life" in 1970. Kneeling, Left to Right ?, Linda Compton, John Aman, ? Robin McNamara (Woof) holds mike for Allan Nicholls (Claude). 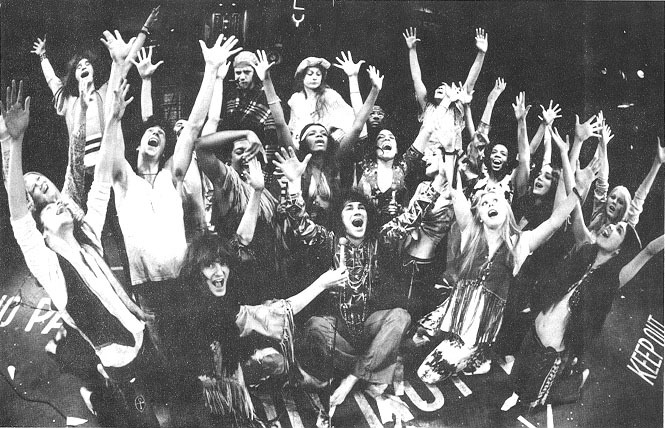 Behind Claude is Mary Lorri Davis, Denise Delapena, Singer Williams (far back), Leata Galloway, Ada Clay?, Victoria Medlin (Sheila), Jessica Harper, Kathryn Ann Wright, Lillian Wong (Crissy). Standing in the back, left to right, Oatis Stephens, ? as Dad, Sally Eaton as Mom, Angie Ortega.